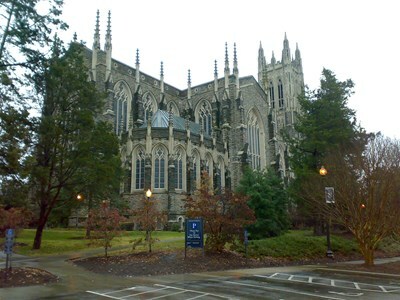 Duke University Chapel is a chapel located at the center of the campus of Duke University in Durham, North Carolina. It is an ecumenical Christian chapel and the center of religion at Duke, and has connections to the United Methodist Church. Constructed from 1930 to 1932, the Chapel seats about 1,800 people and stands 210 feet (64 m) tall, making it one of the tallest buildings in Durham County. This description uses material from the Wikipedia article on Duke Chapel and is licensed under the Creative Commons Attribution-ShareAlike License (view authors). 8 people want to do this. 2 people have done this.